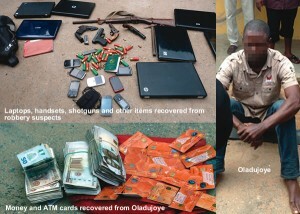 Emerald: Bank Driver Caught with 19 ATM Cards, N652, 000, Says the Cards are Collaterals! Bank Driver Caught with 19 ATM Cards, N652, 000, Says the Cards are Collaterals! Dare Oladujoye, a driver with Zenith Bank, has been arrested by members of the Lagos State Police Command for allegedly being in possession of 19 Guaranty Trust Bank ATM cards and the sum of N652, 000. The suspect had been using the cards to withdraw money from an ATM at Ogba branch of GTB when a security guard raised the alarm. Mr. Umar Manko, the Commissioner of Police for the state police command, said as of the time of his arrest, the suspect had withdrawn N652, 000 from the ATM. According to Manko, “On July 26, 2012, around 8:30pm, there was a distress call that there was commotion at GTB, Ogba branch. On getting there, the suspect was seen with 19 ATM cards. how come all his clients are GTB customers or he still has a pile on other banks ATM cards at home or is it his car boot? naija na wah!